Are you using vibration therapy? Single impulse or multiple impulse adjusting? Or any chiropractic tool? 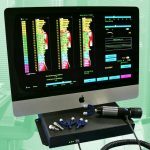 You can trade in ANY chiropractic instrumentation and save thousands on a PulStar G3 Vision Suite. PulStar® G3 Vision Suites are the most advanced and reliable multiple impulse therapy tools currently on the market, and they are available in many forms: from travel suites to desktop suites to suites that are paired with a PulStar-specific patient treatment stand. Every G3 suite is unique and customizable, but they are each designed to both treat the patient with gentle impulses in areas of musculoskeletal misalignment, and to measure progress by analyzing the spine and peripheral joints before and after treatment. Fill out the form to the right to determine the size of your generous discount on the PulStar, or, for faster action, call 1-800-628-9416. If you are currently using ANY chiropractic instrument adjustment tool, you could qualify to save thousands on a PulStar G3 Vision Suite with trade-in. *Trade Up and Save Up offer not valid on the PulStar G3 Entry Suite. Fill out the form below, and we will determine a generous discount on the PulStar for you. Describe the item(s) that you would like to trade in. I would like to schedule a Screen-Share Demo for an additional discount.